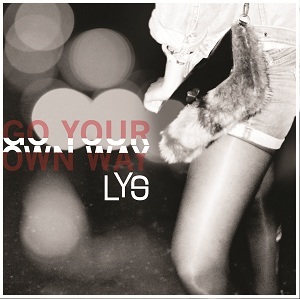 "Go your own way" is the third release from French band LYS. Their debut release in 2009 was "In my mind", and the band followed this in 2011 with "New way home", and at the beginning of 2013 "Go your own way" will be released. They were given a boost after being spotted at a festival in 2011 by Placebo drummer Steve Hewitt who invited them to support him on his European tour. LYS make music that is hard to categorise. My best attempt would be to say that it's pop with a rock influence, and mixes haunting melodies and catchy tunes to make something that is very radio-friendly. "In my mind" is fairly typical of the album - the guitars are fairy muted, the drums have more of a drum machine feel rather than sounding like a proper drum kit, and the vocals are very radio friendly. "So nice" is probably the rockiest tune on the album with the guitars being quite prominent and more powerful than in the rest of the album. Closing track "3 weeks" is a slow song dominated by the synthesiser sounds. It's a nice song but not very memorable. Rock and metal fans aren't going to be interested in this release, but if you prefer radio friendly pop with guitars then this is for you. "Go your own way" will be released on 21st January 2013.